Create a stylish bathroom with a big impact with these small room tips whether you are remodelling or installing a whole new suite. There are lots of ways you can completely transform the appearance of your bathroom without blowing the budget. Even when space is limited in a bathroom it needs to serve numerous purposes. You want a well-planned space that both looks and functions well. Among the challenges: configuring the toilet and sink to code and allowing enough clearance for a shower. 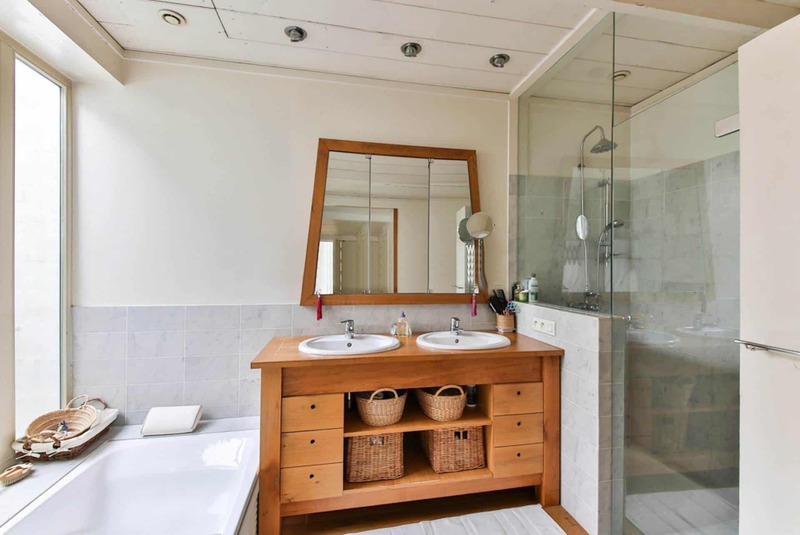 Knowing a few key measurements, like the size of a typical bathtub and how much space is needed for a toilet, will help you plan a remodel more efficiently. To maximise size and create a look that is minimalist and clean why not consider a simple lick of paint? Pick tones of white, off white and neutrals. Type of paint is important, think in terms of sheen quantity and products with mould-inhibiting agents and a better surface for resisting moisture. A shade does not have to be plain but consider sticking to one colour to not overwhelm the room. Don’t be afraid to mix print and texture, how about a thick floor mat and block print shower curtain? Tiles can both add a decorative element to a bathroom and have practical usage as a splashback, being easy to clean and maintain. Adding or altering tiles or wall cladding is a good option if you want a budget friendly remodel. Brickwork patterns are very popular option at the moment as are key tile mosaics on the floor. Think optical illusion, a floor tile with a format of 12″ by 24″ tricks the eye into reading the space as being larger than it is than small mosaic tiles would. Alternatively using the same tiles for floor and wall can create a seamless appearance, and open up the space. Pick the wrong material and you could have maintenance issues on your hands. Seek advice from professionals. Make each inch count. Why not pick wall hung storage units, or even wall mounted sanitary ware, i.e. a sink. Wall mounted products also lead the eye below making the floor areas appear even larger. There is often wasted space above toilet so think smart. Make smart use of the space with the right-sized fixtures, such as slimmer vanities, compact elongated toilets and even smaller tubs from Big bathroom shop. Remember comfort is still essential! The narrow, clean styling of a trough sink is a good-looking space solution. Note: Don’t make the toilet the first thing you see when open the door. Effortless and inexpensive why no buy a large mirror that can be used to give the illusion of space to a small room. Positioning mirrors adjacent to windows is an effective way to maximise and reflect light. Don’t be afraid to go high style, add a vintage dresser or table with a vessel sink. Light is important in a bathroom for optimum lighting, install a light at each side of the mirror and a light source overhead to eliminate shadows. Consider LED lights, they may be more expensive but last much longer. Add accessories but don’t overwhelm. Blinds, vases and towels are great for adding a splash of colour in your bathroom, and you’ll be surprised how it can change the appearance of your bathroom. Tight spaces can make sharp corners hip hazards. If the corners of a vanity would get in the way, opt for a rounded style. Also why not look into getting a corner sink? There are so many options for decorating and remodelling a bathroom, do you have any of your own tips and tricks?